Workplace Email. It's out of control. You'd love to spend your day doing your job so that maybe, just maybe you could get home and enjoy uninterrupted time with your family or get out with friends. Instead, you spend so much time every day managing your inbox that everything else in your life--real work, family, play--is practically an afterthought. It's not a pretty situation for employees or employers. So why do we all put up with it? It turns out that not everyone is. 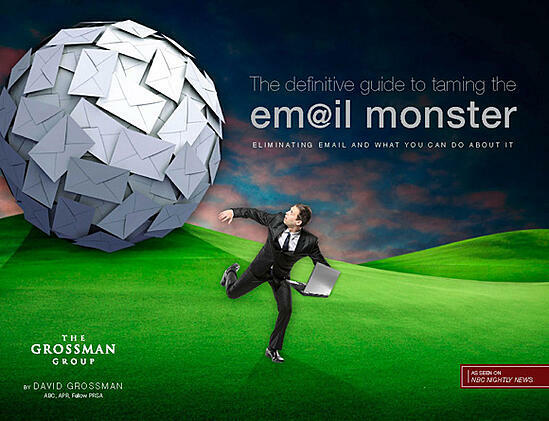 In his new free ebook, internal communications expert David Grossman tackles the email beast--showing what some companies are doing to rein in the email monster, to make better use of working hours, and to cut back on the stress on employees caused by a 24/7 cycle of endless workplace email. He also shares tools and strategies for managing email in the workplace, and explains when it makes sense to use email--and when we should take advantage of the myriad other communication tools at our disposal. It's time to put an end to the tyranny of work email! Download The Definitive Guide to Taming the Email Monster and start putting email back in its place.